Tired of the same generic wolf all the time? You can't identify who's Rex and who's Scooby? Is your pet wolf useless in travels? Then, get this, a (most)major overhaul of wolves! This mod is on heavy testing! Your wolves may disappear after installing the mod for the first time, just recover it with SinglePlayerCommands or something else! The config file is on /.minecraft/WolfVariations. EnableSizeMixOnBreeding - default is true. If enabled, the puppy size will be a "mix" between the parents size. BreedingRate=100 - default is 100. More means less breeding. ClothingMakerID=213 - ID of the Clothing Maker. DebugInfoOnShift=false - default is false. Shows some info of the wolf when shift+right-clicking. ImmuneToFireAndLava=false - default is false. If true, the wolves will be immune to fire and lava. An API(comes with 3 wolves + default) that lets you create your own wolves, without modifying the code. (When a wolf spawn for the first time, it'll choose a type. 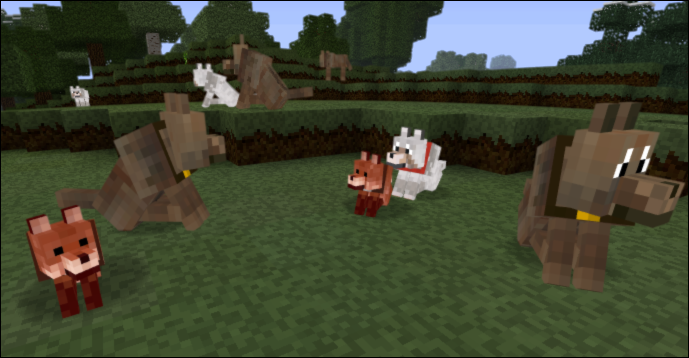 I don't know what happens with already-tamed wolves, but it will not crash I think) The wolves that comes with this pack are: Default, Fox, Brown and Gray, made by user GreenxCactus(Thanks!). 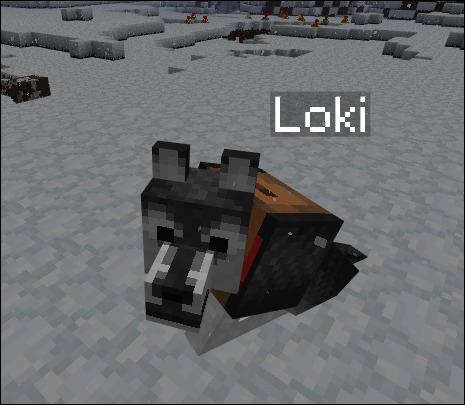 The husky skin that Loki uses was made by user Abra and is not included in the mod. You can now ctrl+rightclick your tamed wolf to show this GUI(backpack slots only shows when it's wearing a backpack). Put the name you want and click "Save". The nametag will now appear over your wolf! You can add clothes to your wolves now! And even make your own clothes with an easy-to-use API! Recipe: 5 wood planks, 3 wool and one iron ingot. To each type of clothing(Headgear, Collar, Bodygear and Backpack), you need a different supply. Headgear supplies: 2 wool blocks and one dye (any color). Collar supplies: 1 wool block and one iron ingot. Bodygear supplies: 3 wool blocks and one dye. Backpack supplies: 2 leather and 2 wool block. That's it: You put the supplies on the first slot, and it'll preview the item in the second. Select the item you want with the arrows and click the "Mk." button to create it. Be careful, the "Mk." button is sensible! 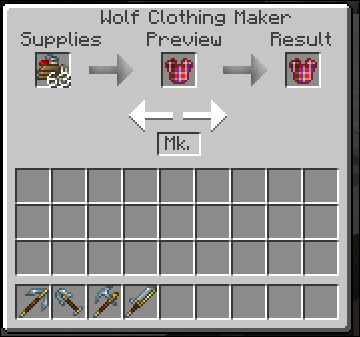 To make your own clothing: Just see how the included clothing works, they are in the Clothing section of WolfVariations folder. You make a text file for the piece with the info, put it in the folder, add in the clothing list, add the textures to your jar and done! 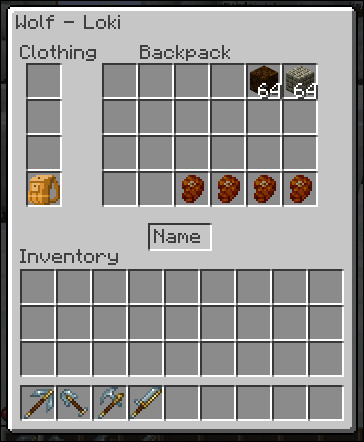 -> Backpack with 4 inventory rows. You want to have more wolves, but can't find one? Already has two wolves? Well, you can reproduce them! 2. Give the bones to each wolf you want to reproduce. 3. Put them together in a place, alone. 4. If you have luck, they'll pop a Puppy. The chances of reproducing again for the parents are reduced every birth. In "WolvesExtended_Config.txt", there's a setting for mixing the sizes. If true(default), the Puppy size will have a mix of the parents sizes, so it creates a new unique variation(if you don't think it's working okay, you can set it to false to it'll have normal sizes)! The texture is randomly chosen between the parents textures. It shows: The wolf name, its parents names and the age. If there's no parent name, it'll have a generic name. The names are registered at the time of birth. And yes, they grow over time. PUPPIES ARE FRAGILE ON WATER, BE CAREFUL! You can now ride your wolves! Any wolf that is at least the default size can be ridden if tamed. To ride it, just jump + right-click your wolf! A item that lets you cycle the wolf types, only useable with tamed wolfs. Has 16 uses. Recipe: Rose red dye, Cactus green dye, lapis lazuli dye and two sticks. Download Wolves Extended v1.5 - For Minecraft 1.7.3 - Requires ModLoader. 2. It's easy to create new wolves. 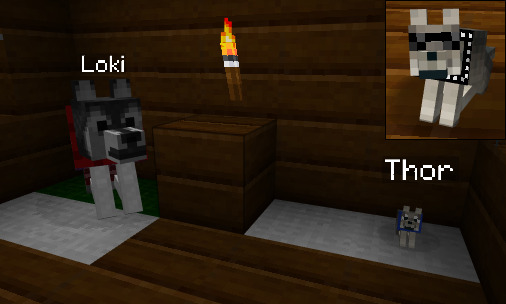 So i'm adding a creeper wolf, with these textures: "creeperwolf.png", "creeperwolf_tame.png" and "creeperwolf_angry.png". I'll put them inside the "mob" folder in minecraft.jar. 4. The speed isn't a big deal. Put "1F" if you don't know what to put. This wolf will be a little more faster than normal wolves, so I put 1.2F. 5. Save the file. Open your "Wolf_List.txt" that is on that folder. Now, simply add the name of the file you added before, without the ".txt". You added a wolf, congrats! OWNER - Luiz Fernando Cardoso(Nandonalt), Original author(s) of the MOD. Under the copyright terms accepted when purchasing Minecraft (http://www.minecraft.net/copyright.jsp) the OWNER has full rights over their MOD despite use of MOJANG code. It doesn't work for me i start with a fresh jar no mods or anything put in modloader delete META-INF and then put in wolf variation and then it crashes. I would post error log but it closes before i can read it. EDIT: As the others say, it crashes and the error screen closes before I can copy + paste. Tried print screen but always was a tad to late. Could you make one that works with all mobs? Thank you, I was sick of having to edit my wolf skins. Guys having errors: Can you post your ModLoader.txt? not downloading till it fixed. Sorry. I am a noob, go easy on me. I just tried adding this mod to my Modded 1.4 jar instead of the clean one, hoping for some luck. Thanks! I forgot to include NandoProps on the download. Please redownload. EDIT: It works! Now to check if TMI and SSP Commands work. Sure thing. I think this is the correct thing you want. It's the "ModLoader.txt" from .minecraft right? FINE: Failed to load mod from "mod_wolfvariations.class"
This doesn't seem to work that well with built-in Texture pack wolfs. It reads and overrides the original "wolf.png" (tame and angry also) from the Minecraft.jar instead of reading it from the texture pack your using it from. Actually, it reads yours wolf.png o_O The wolf closer to Minecraft one is the gray one. This is pretty cool! I still need to experiment with the txt file but I'll try that in a bit. If you don't mind could I make a video just showing off the different wolves? I might make another one later showing how to download and using other wolf textures. I mean if your using any texture pack, it changes your wolf texture from the texture pack to the originals instead of reading it from the texture pack. Deleting the "Wolf.png" (Tame and Angry also) From the "Wolf_Varations" doesn't seem to set it back to the texture pack wolf, instead it turns into the brown wolf. Looks like a cool mod if your bored by wolfs or have many of them. haven't found any wolfs yet though, damn biomes! Where is the raisin tree? I am gonna wait for sdk to release his mod to play with this..
" Hunting~ Season! "shot" " Fetch!!" " bow-wow"z.. If this release on smp, Yog people might play and simon states "Ahh~~~ang" x zillion time that diggy pant off..
Why my wolf turned into the default one?